SAP Business One version for SAP HANA offers many exclusive benefits over the standard SAP Business One on Microsoft SQL Server. 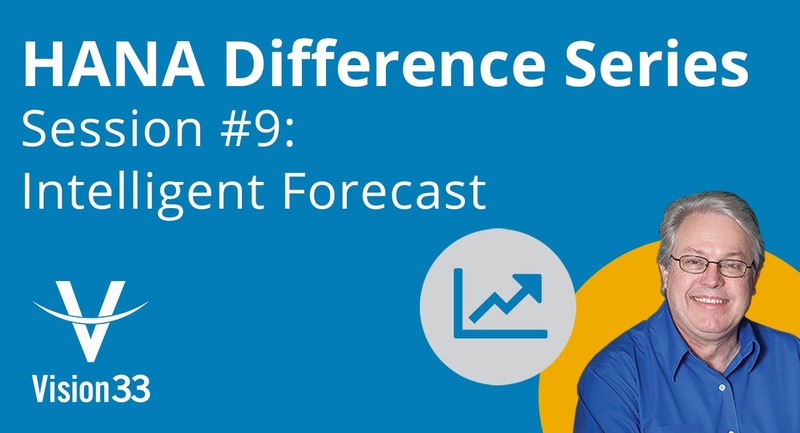 In part 9 of the SAP HANA Difference article series, we focused on an enhanced feature, in SAP Business One version for SAP HANA, the Intelligent Forecast. According to SAP, this forecast brings built-in models based on statistical calculations that help predict trends and seasonal factors inside an organization. For statistics buffs, these calculations include: TESM (Triple Exponential Smoothing) and LRDTSA (Linear Regression with Damped Trend and Seasonal Adjust). By leveraging the advanced analytic power of SAP’s proprietary SAP HANA in-memory analytics, a selection of these calculations is automatically made by the system, taking into the account the best algorithm to be used – this is very sophisticated technology. 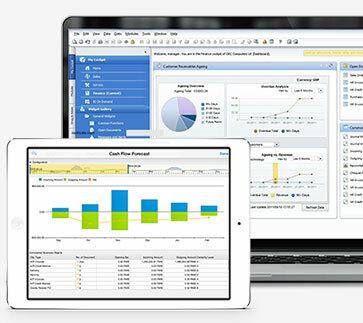 The result generated by the Intelligent Forecast can be used in the MRP Wizard. You have also the ability to leverage the what-if-analysis, by adjusting abnormal past transactions to obtain better predictions for the future. In a recent Vision33 TOTAL Care Wednesday Webchat, our host and SAP Business One ambassador, Carl Lewis, demonstrated Intelligent Forecasting. Available since the release of SAP Business One version for SAP HANA 9.2, users should take note that the feature is slightly hidden within the main navigation; you’ll find it under the MRP in the Modules menu. From MRP, click ‘Forecasts,’ to find it. Note that if you’re using the Microsoft SQL server version of SAP Business One, you’ll still see the feature listed as ‘forecast,’ but you won’t get access to the many enhancements exclusive to the SAP HANA version. In the Intelligent Forecast, users can specify a date range such as a 12-month period, or daily, or weekly. Once you complete the basic setup, you’re ready to create the Intelligent Forecast. What’s the Difference Between a Forecast and an Intelligent Forecast? For one, like many of the features available only in SAP HANA, the intelligent Forecast offers users a graphical user interface to better visualize the information in your specified range. These insightful charts are indeed a hallmark of SAP HANA and its interfaces help the user to understand information at a glance while being able to manipulate the data in real-time. From the Intelligent Forecast screen, you can select a warehouse and an associated range of items from the list of items pages which you can look through. If your inventory is large, you can choose to display more items per page to quickly navigate to the items you’re interested in analyzing. As discussed previously, one difference between an Intelligent Forecast over the standard forecasting in SAP Business One SQL server edition is the calculation method which you can set as either manual or automatic. In the regular forecast found in the standard SAP Business One, the system does a flat average or a seasonality, whereas in SAP HANA, you get much more sophisticated analysis with the statistical calculations outlined above – all in real-time. Moving on, users can specify the warehouses they want to include in the Intelligent Forecast and the Sales History including one of either Sales Orders, Delivery, or A/R Invoices. The Maximum History Time buckets can be edited and the number you select will reflect the date range for the data you want analyzed. Next, click on the Forecast button. In the graphic chart generated, you’ll see every item in the time frame you asked for. You can manipulate the forecast data on the fly as well if you see an outlier in your data selection that is having a disproportionate effect on your forecast. Drag up or down the data you’d like to exclude in the past period using your mouse cursor to ensure it doesn’t impact your report. You can also save the Intelligent Forecast as a template for future use. Want to learn more about how to make use of the Intelligent Forecast in SAP HANA? Watch the Intelligent Forecast video demo for step by step instructions to find out how your business can leverage SAP HANA’s advanced analytics to improve your business forecasting and make better decisions.